Thirty-five songs offering a complete exploration of bluegrass music. Including music theory, tips on performance, bluegrass ensemble playing, backup playing, and a wealth of banjo lore. For beginners and advanced players. 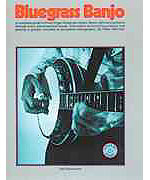 One of the very best five-string bluegrass banjo methods available. Includes note reading, tablature, chord background styles, three finger picking, rolls, licks, runs, fills, and endings, use of the capo, easy solos, and advanced up-the-neck solos in three-finger style! CD is a stereo play-along recording. This stellar collection contains banjo tab arrangements of 12 bluegrass/folk songs from this Grammy-winning Album of the Year. Plus lyrics and a banjo notation legend.